It's easy to take down notes in the field directly into the job that you are undertaking. 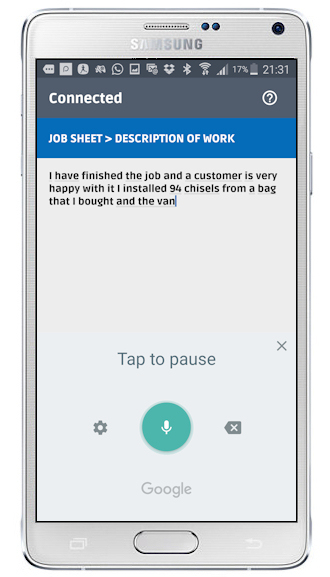 And built into Android is a very useful speech to text converter with a very high degree of accuracy, so those field team members and contractors with banana fingers need not type anymore. Once you have left your notes about the task you have undertaken - or maybe even the reasons you couldn't, they will appear in the jobsheet which can be shared with the office and the client. There is a separate section for follow on work. Fill this in and the office can see that they may very well need to book another appointment or take some further action based on the notes from this visit. Leaving a note now along with some pictures of the task will save a hundred questions from the office ot the client after you have got home after a long day at work. Can't get a connection? Don't panic. Flobot stores the job description and notes on your phone so you will be able get the notes done even when you can't get a 3G or 4G signal. And when you do get one, it will sync with the server automatically and send the jobsheet back to the office.